Google, the king of integrated services online, announced last week that it has begun displaying Google Offers in the Google Maps Android app. Are daily deals moving in a new direction? Google Offers is a deal-of-the-day Google-based website that started up in mid-2011 after Google's failed attempt at a Groupon buyout. The original Google Offers debuted in beta form in the Portland, Oregon area in April of 2011, and the first official offer was released June 1, 2011. By July of that same year, Google Offers had extended their reach to the New York and San Francisco Bay areas. Google's daily deal service is currently available in 42 U.S. cities and new locations are being added on a regular basis. Despite being active for nearly one year, Google Offers continues to operate in beta mode and still has a very limited reach. 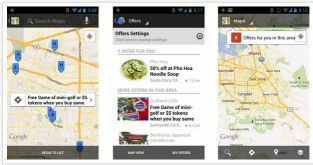 On May 9, 2012, Google Maps confirmed on Google+ and the Google Commerce blog that Google Maps for Android had finally fully integrated with Google Offers. Consumers who access Google Maps on an Android device will now begin receiving targeted offers for nearby daily deals and coupons when doing a search for local businesses. "Today we released the latest version of Google Maps for Android. With this version, those of you in the U.S. will be able to find +Google Offers from nearby businesses—everything from restaurants, to salons to city tours —right from your Maps app. We’ve also added indoor walking directions in the U.S. and Japan, and 360-degree interior photos of businesses," said Google. Are daily deals going mobile? As the daily deals market matures, competing companies appear to be moving in opposing directions. In March, LivingSocial announced that it would no longer focus on distributing location-based deals via mobile phones after an unsuccessful mobile campaign. Meanwhile AmEx entered the mobile daily deal market just last week with its newest American Express app. While each daily deal website goes a different direction, one thing is for certain: the daily deal market is evolving and working to meet consumers no matter where they may be. And that's good news for everyone! Google Maps for Android is available on Google Play free of charge. To learn more, check out this video.